Intel may be preparing to add a new tier of processor to its lineup, with an image suggesting a new high-end Core i9 with six processors using the "Kaby Lake-X" and "Skylake-X" architectures are set to be unveiled by the chip producer starting in June —but if they will see the light of day in an Apple desktop isn't clear. 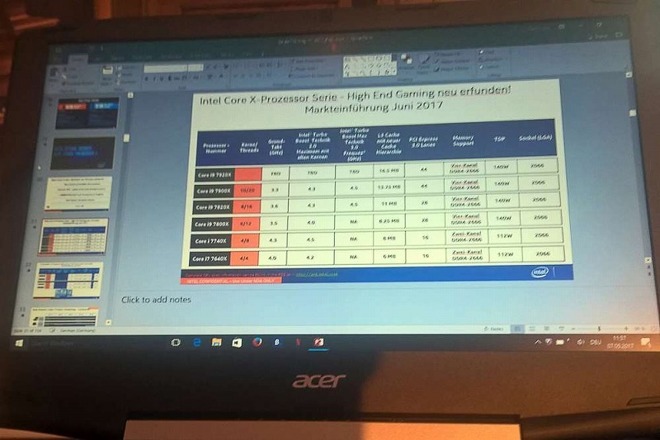 The post on the Anandtech forums by user "Sweepr" indicates there will be four Core i9 processors, two each in the i9-7900 and i9-7800 ranges, along with two Core i7 chips. The highlight of the list is the Core i9-7920X, which will have 12 cores and 24 threads, and 16.5 megabytes of L3 cache, but clock speeds for the chip were not revealed. The Core i9-7900X has 10 cores, 20 threads, and 13.75 megabytes of L3 cache, with both 7900-series chips offering 44 PCIe lanes. It is claimed the i9-7900X will offer a base clock speed of 3.3GHz, rising to 4.3GHz under Turbo Clock 2.0, and up to 4.5GHz under Turbo Clock 3.0, a third clock state that can allow the processors to perform at a higher clock speed than in Broadwell-E. The Core i9-7820X is said to have 8 cores, 16 threads, and 11MB of L3 cache, while the i9-7800X offers 6 cores and 12 threads, along with a lower base clock speed of 3.5GHz to the i9-7820X's 3.6Ghz. 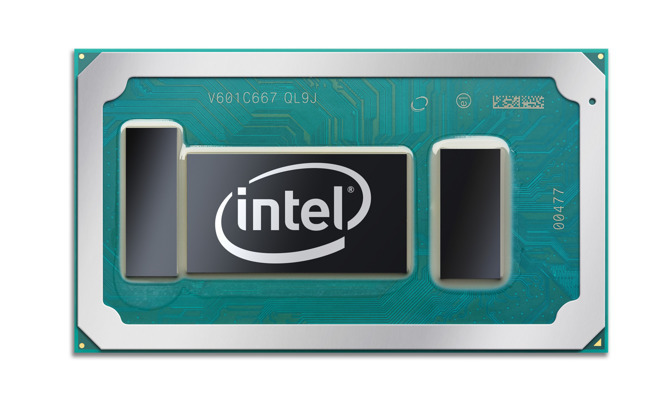 Both processors are claimed to use 28 PCIe lanes, with the i9-7820X also boasting Turbo Clock 3.0 support up to 4.5GHz. The two Core i7 processors are the i7-7740K and the i7-7640K, with the quad-core chips using 8MB and 6MB of L3 cache respectively, and supporting 16 PCIe lanes. According to the forum post, there will be 1MB of L2 cache in the Skylake-X chips, with support for Dual DDR4-2666 in the Kaby Lake-X processors and Quad DDR4-2666 for the Skylake-X group. All of the Core i9 variants will also apparently support AVX-512 extensions, new instructions that will double the number and width of data registers compared to Intel's AVX2. It is believed Intel will launch the new processors in June, except for the Core i9-7920X, which will apparently be unveiled in August. Pricing is not yet known, but is presumably well in excess of existing non-Xeon Skylake and Kaby Lake processors. While faster processors would be welcomed by desktop Mac users, it is uncertain whether or not Apple would put the chips into its higher-specification iMac or refreshed Mac Pro. The 12-core Xeon E5 processor used in the highest-specification Mac Pro currently available has a TDP of 130W. The forum post suggests the new chips will offer a usable TDP of 112W for the Kaby Lake-X chips, but the higher-power Skylake-X processors could have a TDP of up to 140W, potentially making thermal management a concern if Apple decides to use it in the future —if it sticks with a similar thermal profile. In an April interview about the 2018 Mac Pro refresh, Apple software chief Craig Federighi admitted the company had backed itself into a "thermal corner" with the computer's design. The modular design for the next generation of the Mac Pro may help Apple avoid such thermal design issues, and potentially allow for the inclusion of these higher TDP chips.